Meditation is a component of almost all religions, and has been practiced for over 5,000 years. Meditative disciplines encompass a wide range of spiritual and/or psychophysical practices which may emphasize different goals - from achievement of a higher state of consciousness, to greater focus, creativity and self-awareness, or simply a more relaxed and peaceful frame of mind. Some forms emphasize concentration - focusing the attention on a single point in order to bring about a state of peace and tranquility. Other forms emphasize "Mindfulness" in which the attention opens to whatever presents itself in the moment: physical sensations, feelings, thoughts and states of mind. Mindfulness practices cultivate wisdom. The last thing you’d expect to see at a national political convention is a group of delegates sitting down in the midst of the clash and clamor for a few minutes of silent meditation. But that’s exactly what a group called “Meditate08” hopes will happen at the Democratic National Convention this summer. OK, maybe not at the Convention itself, but at least within sight of it at nearby Fishback-Landing Park. The group is planning a six day meditation retreat to coincide with the Convention, August 23 - 28. Over thirty Buddhist, Christian, Jewish, Hindu, Muslim and secular presenters have been invited to give teachings and lead hour-and-a-half long sessions in meditation, yoga, stress reduction. Evening programs feature Dances for Universal Peace, Kirtan Chanting, and local song writers and singers. The founding sponsors for this event are EarthNest Institute, and the Insight Meditation Community of Colorado, a Theravada Buddhist meditation society. The M08 steering committee is comprised of contemplatives from a wide assortment of schools and traditions, believe that there is - or should be - a place for Emptiness in the political process, and that the nation’s interests are best served by those who can connect with their basic goodness through the simple act of silent meditation. The project is the brain child of Denver psychiatrist Dr. David Nichol, a long time Buddhist practitioner and author of The One Minute Meditator. It was Dr. Nichol who last April put his name into the lottery for use of a city park during the conclave. Much to everyone’s amazement, he won, not just one day, but all six. A committee was formed and it has been meeting every two weeks to plan what may be the first multi-denominational meditation retreat in US political history. There’s a saying in the Zen tradition, “When you truly embark upon the path of Dharma, Bodhisattvas spring up all around to help you.” A Bodhisattva is one who comes into the world for no other purpose than to be of service, and lately they’ve been popping up all over the place. Full House Marketing, a Denver firm with meditator John Schick at the helm, has stepped in to handle web design and media relations. Several people have plunked down five hundred dollars apiece to help offset the event’s anticipated $8,000 price tag. (Contributions are tax-deductible) The list of sponsors is growing and now includes the Naropa University, Denver Shambhala Meditation Center, The Peacemaker Insititute, St. Paul United Methodist Church, and the Zen Center of Denver. See the Sponsors page for a complete list. The event is free and open to anyone - delegates, candidates, press, protestors, tourists and locals - who happens to be in town that week. There’s never been a better time for meditators to show their stuff; demonstrating peace, countering the forces of darkness and - who knows - maybe even inspiring a politician or two to drop by, sit down, and be quiet for just long enough to listen to their heart. Don Morreale has been practicing Buddhist meditation since 1968. A graduate of the Community Dharma Leader Training Program at Spirit Rock Meditation Center, he’s the author of The Complete Guide to Buddhist America and Chair of the Meditate08 Steering Committee. We encourage and support diversity. Therefore Meditate 08 will be both inter-faith and multi-cultural. Meditation groups from all religious and secular contemplative traditions have been invited to participate. Meditate '08 and our sponsors will not allow or condone any form of lobbying, electoral activity, or political favoritism. We do not promote any candidate or party over any other candidate or party and we do not allow any form of proselytizing or political protest. We reserve the right to deny use of the venue to any person or entity unwilling to abide by this stipulation. 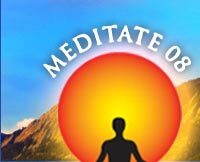 Every effort will be made to insure that Meditate 08 will have as little impact as possible on the environment. We will therefore respect the park’s prairie grass natural habitat. We will see to it that trash is picked up and that the site is left clean and undamaged. Any disposable items provided by Meditate 08 will be biodegradable or otherwise recyclable. Participants will be encouraged to carpool, take public transportation, walk or ride a bike to the event. Our power needs are met off the grid; the sound system will be powered by a portable photo-voltaic panel.